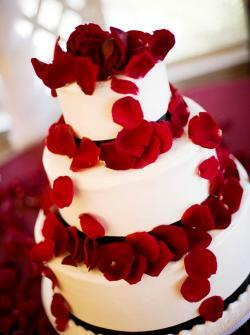 A red rose wedding cake is one of the most elegant and refined choices a couple can have for their reception dessert. Roses are classically beautiful flowers and practically universal symbols of love, so they're especially fitting as wedding cake decorations. 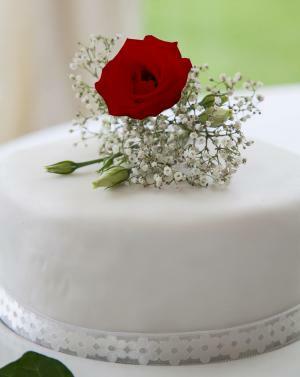 Although particularly suitable for Valentine's Day weddings, red rose wedding cakes look beautiful at any time of year. 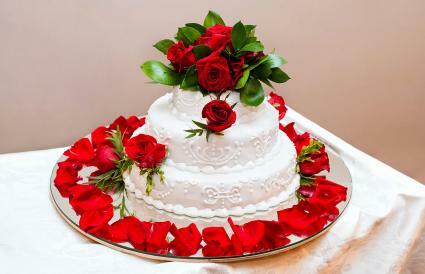 You don't need to get married on Valentine's Day to take advantage of a beautiful heart-shaped cake that features roses. Red is the color of love, so selecting one in the shape of a heart only makes sense. Draping fondant adds to the romantic imagery of this cake. Don't underestimate the impact that a single rose can have on a wedding cake of any size. Using a rose as a cake topper is common, and it's especially beautiful on a level cake that doesn't have any pillars or tiers. 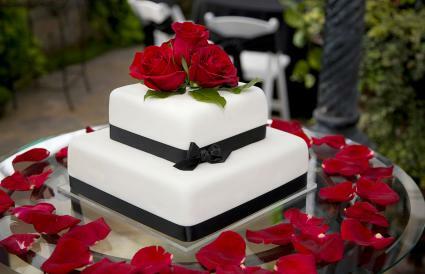 For a unique look, keep the rose stem and leaves intact and lay the entire flower across the top of the cake. Alternatively, add baby's breath to make the red pop. Single roses work very well for intimate weddings that feature compact cupcake displays or small round cakes. Cakes with three tiers are a common wedding cake size. Decorate the sides of the white cake with a buttercream design. Add roses with greenery to the top of the cake; a few strategically placed roses on the layers won't distract from the buttercream design. Scatter petals around the base to complete the cake table display. Rose petals are synonymous with romance, so scattering them across the layers of your cake and around the reception display area will give your dessert an immediate visual connection with love. Combine the petals with a few full roses for a more organized look, or keep full flowers on the cake and simply scatter petals around the dessert. 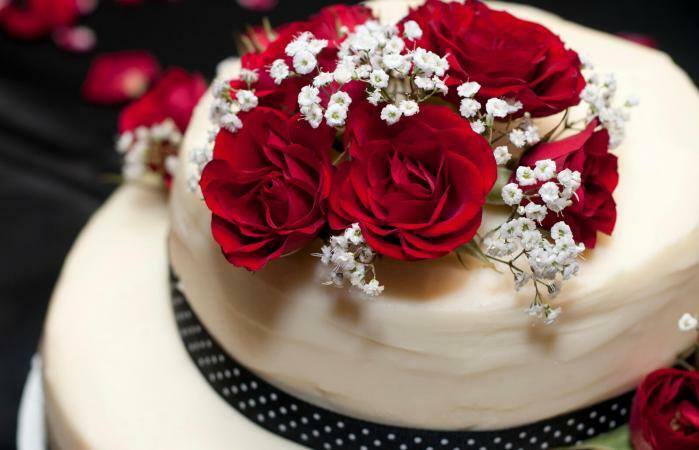 A cake with just red roses may seem plain. A simple way to add more interest and move the eye around the cake is to include ribbon around the base of each cake layer. This not only hides minor flaws, but is another area to highlight your red color scheme. 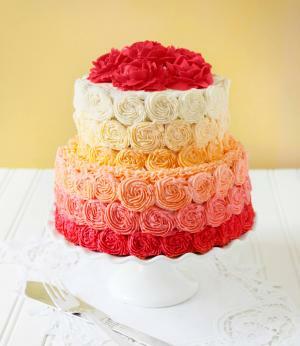 Use fondant, buttercream, or even live flowers with a ribbon. A cascade style wedding cake traditionally features a small bundle of flowers at the top of the cake and includes more flowers that trail down the tiers to the bottom. Cascade cakes are a popular option when incorporating any type of flower, but they look particularly striking with red roses. Enhance the visual appeal of the cake by requesting pure white or off-white frosting, and use either a curving or snaking cascade pattern. Although red rose cascades are normally seen on round cakes, they also look fantastic going down the corners of tiered square cakes. Placing fresh flowers on your cake with some greenery is a gorgeous idea in any season. Keep things looking their best by storing in a chilled cooler until it's time to slice and serve the cake. This works best outdoors when you're only doing a simple topper. If you want to adorn your cake with multiple blooms that look beautiful throughout the reception, consider an indoor space. 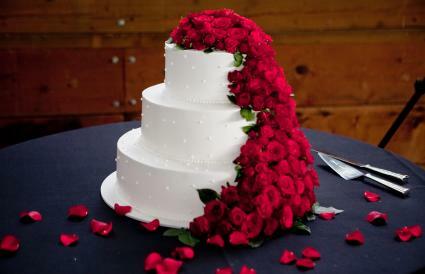 A red rose wedding cake doesn't have to come with fresh flowers. 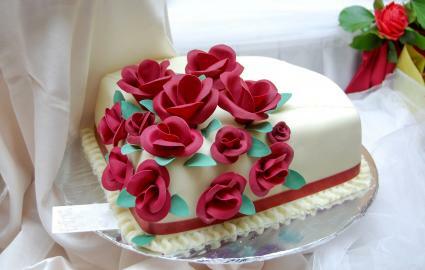 If you'd prefer that the whole cake be edible, ask your decorator to make sugar roses with fondant or gum paste. A few can go a long way, but you can also choose to have the whole cake covered in roses or include large bundles of them between tiers. Another option is to cover the sides of the cake in buttercream roses and have them fade as they travel up the cake. Then top with red sugar roses. While red and white and red, white, and black are classic color combinations for a luxurious wedding, red roses also look striking with metallics like gold. A cake that is covered in fondant can be dusted or sprayed with edible gold coloring. The red ribbon and large open roses on top create a striking image for guests. A gold monogram topper complete the elegant wedding cake. 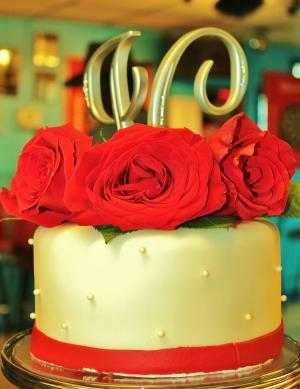 Whether you want a custom cake or a design that's strictly traditional, it's evident from their popularity that red roses can help enhance any type of pattern. 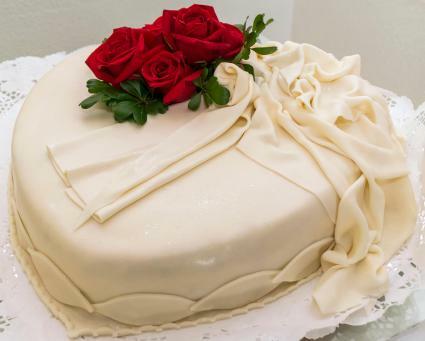 Roses present a gorgeous color contrast on traditional white cakes, they emphasize true elegance and sophistication, and they're an affordable way for any couple to add flair to their wedding dessert.